Next weekend we will be at the Estetika exhibition in Brussels Expo and that includes special offers! – Buy now and benefit from FREE trainings! – There is also a 15% discount on the training courses of Julia Gerus and Tanya Savchenko. 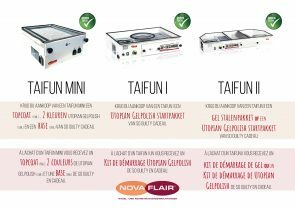 – On top of that we give PRESENTS when you purchase a Taifun! These actions are valid until 31 March 2019. This both on Estetika, as in the shop, as on the webshop.